This article was written by Donna Cromeans with contributions by Sam D, Luana Arturi, and Jessica Lerner. Article edited by Donna Cromeans (@DJRiter). Article prepared for publication by Aimee Hicks. Six years prior to publishing and cinematic success of Gone Girl, author Gillian Flynn had written a dark, haunting novel about a deeply damaged woman named Camille Preaker in her first novel Sharp Objects. 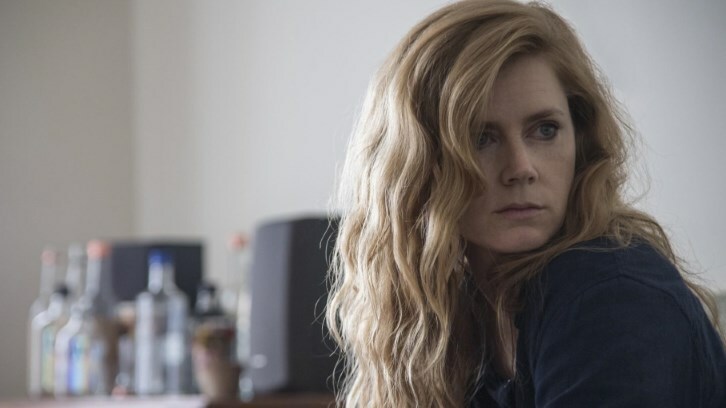 New fans of Flynn and Gone Girl began seeking out her previous works, among them five-time Oscar nominee, Amy Adams who was drawn to the dark character of Camille. She sought to bring Camille to life in an eight-part HBO mini-series and in a stunning, raw performance has brought this complex character to television. The show has garnered critical praise, chiefly for Adams, who in her portrayal, digs deep and embodies every dark, anguishing emotion of Camille's despair, self-loathing, and surprisingly her will to survive. It is a triumphant return to television for Adams who has not appeared on television since a guest appearance on The Office in 2005. Key moments in this tour-de-force, was her mesmerizing performance in the third episode of Sharp Objects, Fix (1x3). In this episode, we are given a glimpse of what could have been Camille's first steps toward survival. For that performance, she has earned the honor of Spoiler TV's Staff Choice Performer of the Month for July. There is an old saying, "You can't go home again." There is perhaps no one person for whom this was more apt than Camille. Unfortunately, it's also a lesson that she must learn the hard way. She knows she's in a fragile state emotionally, but there is a determination that Adams gives her that displays a strength in facing some of the demons of her past. Despite her tenuous progress, at her core, Camille is still a damaged woman with more demons to face and is fighting for survival. When Camille first appears in this episode she is in her childhood bedroom, alone in the dark working. That she doesn't want to be there, in this town, in this house is obvious and Adam's defeated posture and emotionless face sends that message very clearly. But, her editor, perhaps the only person in the world who still has faith in her, believes she can do this so her loyalty to him and a keen sense of preservation (though she may not recognize it as such) will see it through. But, not without the help of her ever-present vodka-filled water bottle. Her detached reverie so expertly expressed in Adam's demeanor is broken when she looks down out the window and sees Amma (Eliza Scanlen) stumbling home, drunk. It's a scene she's familiar with, acting out, doing anything she can to escape the suffocation of her mother, Adora (Patricia Clarkson). As we have seen briefly, Camille does possess empathy for others, and that's what drives her to go down to help Amma get in without incurring Adora's wrath. Then, in a nicely written scene, Camille and Amma seem to connect as sisters for the first time. There's a nice, one might say even sisterly chemistry between Adams and Scanlen. Adams, while on one hand empathizes and sees herself in Amma and her actions, attempts to reach out without showing her vulnerabilities to the sister she's never known, but tries to help. The sisters have something in common, trying to survive in their mother's house. After Amma goes to sleep, Camille flashes back to another young girl she once tried to help, her rehab roommate, Alice (Sydney Sweeney). She relives the moments she made the decision to check herself into rehab, but not before one last act of cutting before going in. Adam's emotional detachment Camille harms herself is on point and heart-breaking. But then, her going into rehab, is an important step for Camille. It is said the first step in becoming stronger is recognizing you need help. The fact that Camille realizes this and walks through those doors. Though there is a sadness that Camille comes there alone, no friend, no colleague, no family member there to support her is telling. There's an emptiness in Adam's eyes at this point that says so much about Camille, in that she's alone, she believes she's supposed to be alone and is supposed to handle this, alone. Camille is awakened from her flashback by a phone call from her editor/friend, Frank (Miguel Sandoval). Perhaps if there is one person Camille wants to please, it's him. Though tired, physically and emotionally, Camille does come alive when talking to him, Adams defeatist posture and plodding movements perfectly illustrating this as she drags herself out of bed and back to work knowing she can't disappoint one of the few people she believes is truly concerned about her. She could be aware too, that he sounds weaker each time he calls and knows that with his illness her won't always be around to take care of her. That core survival instinct kicks in and she gets up to take care of herself. As Camille sets out for her assignment, she practically runs down the stairs, Adam's letting the audience know just how she cannot get out of this house fast enough. But something stops her just short of the exit. It's the sound of her mother with her sister in the next room. As she listens to the kind, nurturing words muttered to her sister, the words she never got to hear from her mother, the look on Adam's face is utterly heartbreaking as that realization strikes her. Even in such a moment, Adams expertly shows off the depth of Camille's pain and perhaps even jealousy. At Natalie's family's home, both mother and brother of the deceased immediately reject Camille. Facing this, Adams is apt to portray Camille's tired, worn, but ultimately used to this kind of rude treatment attitude. She's numb to it now. 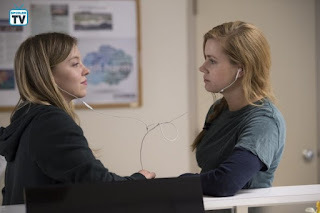 But she does get the chance to speak to John's girlfriend, Adams keeps her cards close to her chest as Ashley (Madison Davenport) presses on about Camille herself with her folded arms and quiet reactions. Ashley goes on and on about how cool Camille was in the past, and Camille doesn't feel that way. Adams masterfully takes Camille from being cordial and polite to annoyed and standoffish as she is confronted with ghosts from her past via this girl. She inches towards leaving, but the girl's offer to help her talk to John (Taylor John Smith) gives her a renewed interest and an openness to her, but Adams has Camille retreat into herself as this girl goes on again to compliment Camille, something Adams shows us makes her very uncomfortable. In another flashback to rehab, Alice and Camille continue to bond as the older woman helps the young girl get ready for a visit from her family. At first, the nice easy rhythm between Adams and Sweeney, makes it appear like the two are sisters doing things sisters do, help each other with their make-up, talk about clothes, and diss their mothers. Yet, beneath all that is a sad reality that the two are roommates in rehab and in a moment of raw honesty open up to one another and share their scars both literally and figuratively. There is an irony of the roles to two play here, one wants to grow up and be an adult too fast, and the other, the adult admits she isn't good at the adulting thing and wants to be like Peter Pan and never grow up. As a show of further bonding, Alice gets the nurse to allow Camille and her to listen to her iPod, each sharing an earbud. The look they share between them is one of mutual respect and understanding of sorrow, and how they can have a break from it all by listening to the music. As they listen, Adams brings out this vulnerability in Camille as she clearly feels this sense of relief of being able to get lost in the music, at least for this moment. As Camille flashes back to this moment driving in her car and listening to similar music, there is this mixture of pain, regret, and sadness over her that no music can truly wash her away from, and Adams makes that clear, before trying her hardest to force these emotions into the music. But she gets some respite from this when Camille sees Willis (Chris Messina) entering a diner and decides to confront him. Choking down her feelings, Adams enters the diner brusquely, coolly, and confidently. Adams keeps complete control over this scene and with this character. Any show of weakness is now gone as she confidently pushes into the detective both personally and professionally. As the detective pushes back, Adams easily holds her own against him, not backing down one bit. But then she starts to wane as Richard talks about the sob story piece she wrote about Natalie, putting her down for it. But as fast as that mask of confidence falls Adams is sure to put it back up just quickly, at least until he leaves. Later, she flashbacks again to her time with Alice, every inch of that tough reporter mask gone. She's brought out of this reverie quite suddenly. The speed with which Adams has Camille muster up that confidence again is truly remarkable. The sheriff (Matt Craven) is clearly not pleased with her digging into these murders, and Adams does not allow Camille to be outwardly fazed by this at all, keeping her steady no matter how much this sheriff tries to move her. For an actress of Adams' caliber, portraying the emotionally scarred Camille Preaker seems as effortless as taking a breath. However, Adams' performance should be applauded on another level as her minute movements and subtle shift in body language bring the reporter alive. As Camille talks with Bob Nash (Will Chase) about his daughter, she sits simply on the bed, tape recorder and notepad in hand, earnestly listening as the father tells his story. Adams depicts with such ease the professional nature of a journalist that it's almost as if she has been doing it her whole life. In a less skilled actor, the subtle pauses and understanding demeanor would have been almost robotic, or even nonexistent, but Adams expresses such empathy, and then tension when Adora enters the room, with her nonverbal gestures. The shift in Camille's manner is quiet, to the point where viewers can't put their finger on what is different but instantly recognizes a change. Then Adams allows Camille's anger to bubble over in the car, again brilliantly, through nonverbal communication; the screaming and hitting the steering wheel say more than words ever could. Before Camille's rage can consume her, the sight of Amma on roller skates piques her interest, with Adams seamlessly shifting from certain anger to outright curiosity. As Camille follows Amma, she drives and then walks, with a slight hesitation, but a sense of purpose nonetheless, again able to communicate her characters' feelings by actions alone. Then when Camille talks with Ashley and John, Adams shows that her previous performance as a seasoned journalist wasn't a fluke, beautifully replicating the small mannerisms. There's such a fluidity in her motions and tone that makes people want to open up to her. Neither Bob nor John have any reservations about confiding in Camille due to Adams' impeccable presence. Starting by asking John some softball questions, Adams can pivot exquisitely to ask the harder hitting questions, even managing to turn some around for John to answer. The simplicity and effortlessness of it all are remarkable, almost as if this is second nature to Adams. When Camille gets home she finds her mother gardening. In what should be discussed as a master class in acting, Adams and Clarkson show, in this short, small scene, the nature of their complicated mother/daughter relationship is crystal clear. Camille stands there calling for her mother's attention while Adora has her back turned only looking at her to spew hatred her way. Camille apologizes for her "intrusions" but Adora only cuts deeper telling her she never means it, but she always causes so much hurt. And when she cuts herself she blames Camille who looks at her incredulous, but her mother comes in hot once again saying she never takes responsibility for anything. Adams has Camille visibly close in on herself as her mother once again goes on the attack, she becomes the young girl desperate for her mother's attention, then when she realizes it is not forthcoming, straightens her spine, steeling herself once again becoming the hard, jaded woman she now is. In a flashback to her days at the clinic, Camille watches as her mother makes a scene and refuses to see her because the roses she brought must be stripped off their thorns and then she looks at Alice who's visit doesn't seem to be going well either. Later, in their room, Alice asks if things get better with family and she doesn't want to lie to her, so she says "no". She realizes she's not helping so to make things better she charms the nurse into giving her Alice's music, and they lay together for a while. This is another nice bonding scene between Adams and Sweeney, they relate to one another, bonding in their pain and desire to be loved. Camille is trying to write, ignoring the ghost of Alice who seems like a huge weight on her, when Amma interrupts her, inquiring about her investigation. Adam's varying body language in this scene shows us a woman who seems entertained by her sister and worried for her at the same time, filling the role of the big sister immediately even if they haven't known each other long. She begs her little sister not to go out, but she gets defensive when Amma touches the edges of her scars and they say goodnight. She tries to concentrate but the memories are too strong, she decides to go to Marian's room but while she's looking at a picture she sees Alice's body in the reflection and she drops it in shock. Camille goes straight to the bar in search of lubrication for her sharp thoughts and when she sees Willis sitting there she decides to buy him a drink as a peace offering for the trouble she's been causing. She turns her charm on, trying to get information out of him and they make a deal, she'll show him around Wind Gap if he answers a few questions on the record. At times, in this scene, Adams is the femme fatale while turning on a dime to show her vulnerability, opening herself up to this person for reasons that puzzle her. It a lesson in acting subtlety, knowing when to go full force and when to pull back to allow the quieter moments time to breathe. The Wind Gap pariahs continue to drink by the railroad once the bar is close, flirting and quizzing each other until they're interrupted by Amma and her posy. The kids are all drunk and Amma is especially spicy, she says she thought Camille was staying in and she points out maybe neither of them can be trusted. Amma disrespects them both and even tells Willis to ask Camille about her past with boys, and she starts to get angry and tells her to stop. She grabs her when Amma crosses the line but when Amma tells her to be dangerous like Adora said she hesitates when Amma finally leaves she's annoyed and doesn't even feel like accepting Richard's help so she tells him she's walking to her car. The myriad of emotions on display on Adams face during this scene are amazing, from accepting Richard's compassion to annoyance, anger and then a return to the self-loathing and belief she doesn't deserve to be loved. Sick of it all Camille starts driving home to St. Louis, immersed in her memories of Alice. She's completely in shock when she comes back to the room and finds her on the floor, she tries to sit next to her, but she feels compelled to throw up and at that moment, she sees a screw from the toilet she uses to cut herself. Camille is halfway through to St. Louis when she sees Alice's ghost in the middle of the road and she halts the car, she knows she's not there but she's tired and angry, and confused, she realizes the song that's playing on the background only makes things worse so she throws the phone out the window, she's exhausted of her ghosts but she doesn't know how to get rid of them. Every emotion Camille Preaker experiences in this episode and series play in Amy Adam's face like a subtitle, she embodies this shattered character like no one else could, she makes people feel for her and root for her even when everyone in Sharp Objects seems broken beyond repair. For some performers, words like brilliant, mesmerizing, stunning, raw, visceral are sometimes bandied about with casual abandon. Then, you have a performer like Amy Adams, who digs so very deep within herself to create a character like this in a masterful, memorable performance. Which was again why she was chosen Spoiler TV's Staff Choice Performer of the Month for July. While not all aspects of Amy Adam's incredible work in this episode may not have been covered, feel free to discuss your thoughts in the comments below.